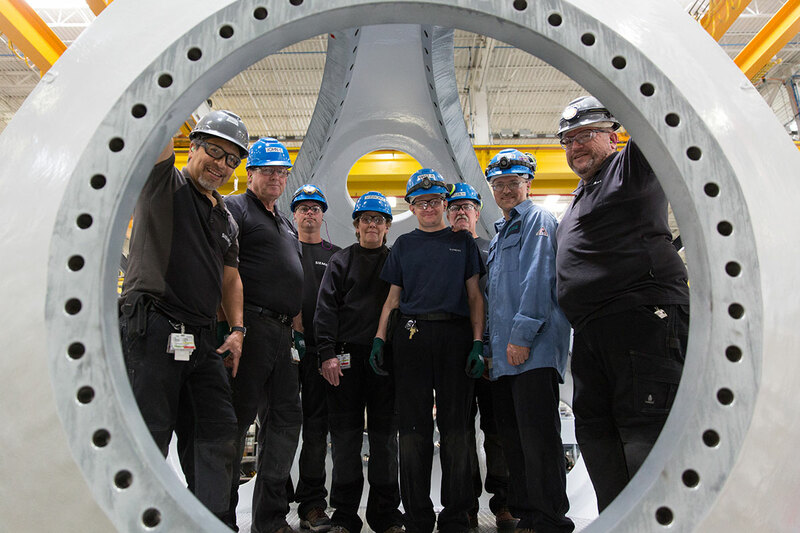 A pipe dream not so long ago, wind power in the U.S. is now a $13 billion business, cost-competitive with natural gas, and expected to deliver more than a third of the nation’s energy by 2050. 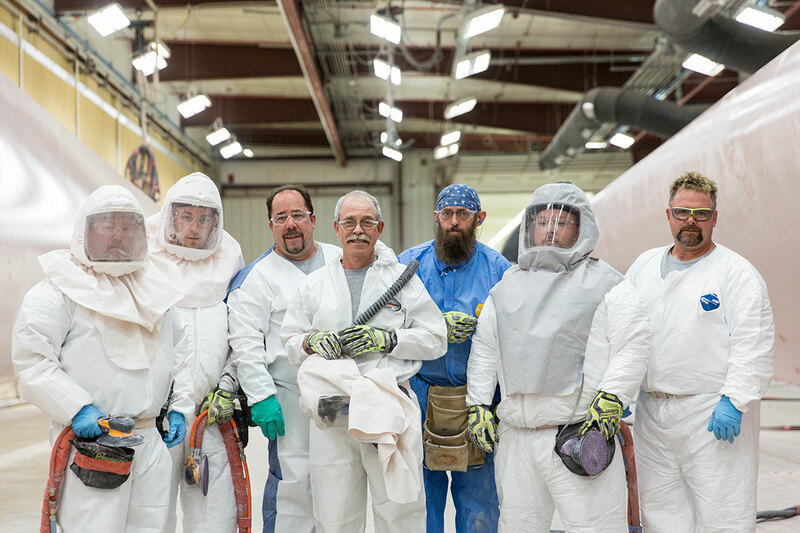 Once a pipe dream, U.S. wind power is now a $13 billion business, cost-competitive with natural gas, and expected to deliver a third of the nation’s energy by 2050. In the summer of 1887, Professor James Blyth, of Anderson’s College in Glasgow, built a wind turbine, the world’s first, and installed it in his holiday cottage in Marykirk. Ten meters high with a cloth sail, the device produced power enough to illuminate his little house for the next 25 years. Since he had more than enough, he offered the surplus to locals so they could light the main street of town. Fortune magazine reports that the price of this renewable has fallen to just over two cents per kilowatt-hour, making it competitive with natural gas. With use surging, the Department of Energy has set targets for wind to furnish 10% of the country’s energy needs by 2020, 20% by 2030 and 35% by 2050. The DOE’s National Renewable Energy Lab estimates that wind power alone could theoretically produce nine times the electricity being consumed in this country today. 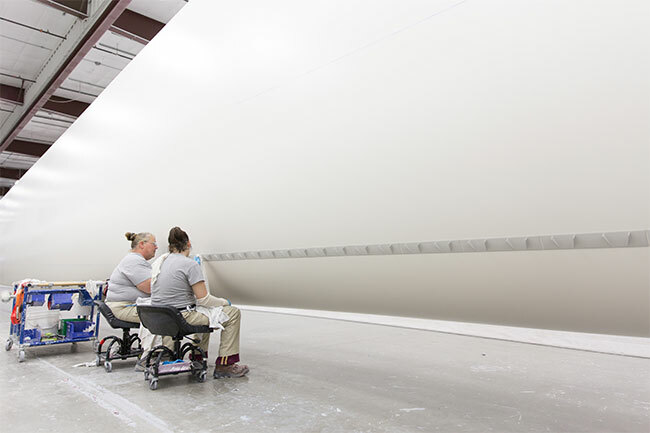 At the plant in Fort Madison, Iowa, an inspector goes over every inch of the blade before it is spray-painted (top), and as one of the final steps of the production process (above), workers check exact placement of the blades’ sound-reducing tiles. Make that a very long time. 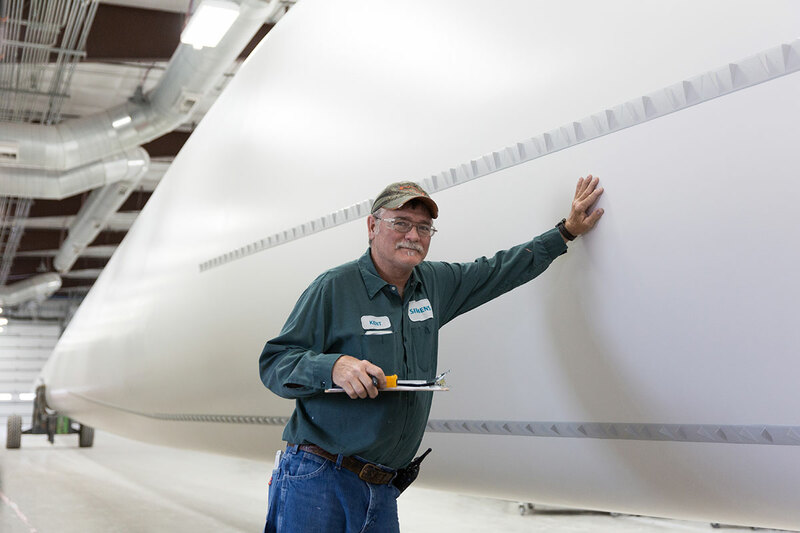 Ever since its debut in the mid-1970s, the U.S. wind-power business has had to struggle with the fickleness of government favor. At the beginning it seemed success might never come. Following the Arab oil embargo, California offered the industry its first tax credit, and energy analyst Daniel Yergin later described the results: “Committed wind advocates, serious developers, skilled engineers, and practical visionaries were joined by flimflam promoters, tax shelter salesmen, and quick-buck artists. Thus was the modern wind industry born.” It didn’t help that the wind was too strong for the technology of the time. Since then, technical know-how has grown exponentially. 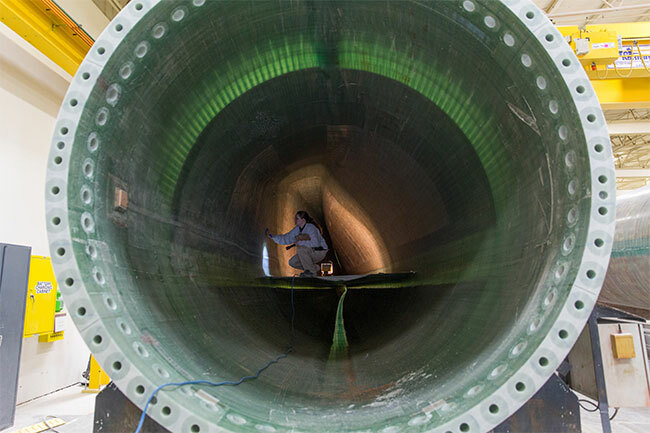 Innovations by Siemens and other industrial giants have made wind a mainstream energy source. 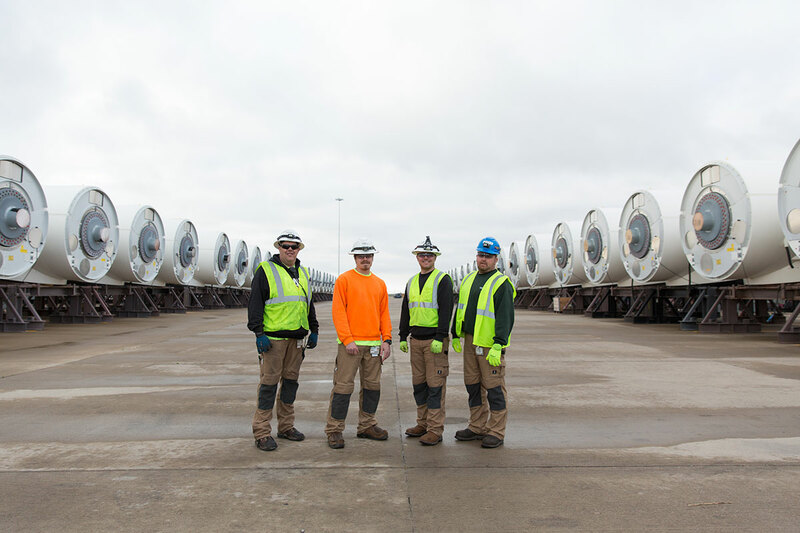 One sign they’re doing something right: Facebook, Microsoft, and Google have all established wind-powered data centers in the Midwest. Meanwhile, the technology races ahead very visibly: The big parts are getting steadily bigger. Since wind speed increases with altitude, the latest wind towers are shooting up to meet it. According to the DOE, increasing the height of a tower from about 98 meters, the current standard, to 137 meters can bring energy gains of 20 to 45 percent. Blades are getting longer in concert. 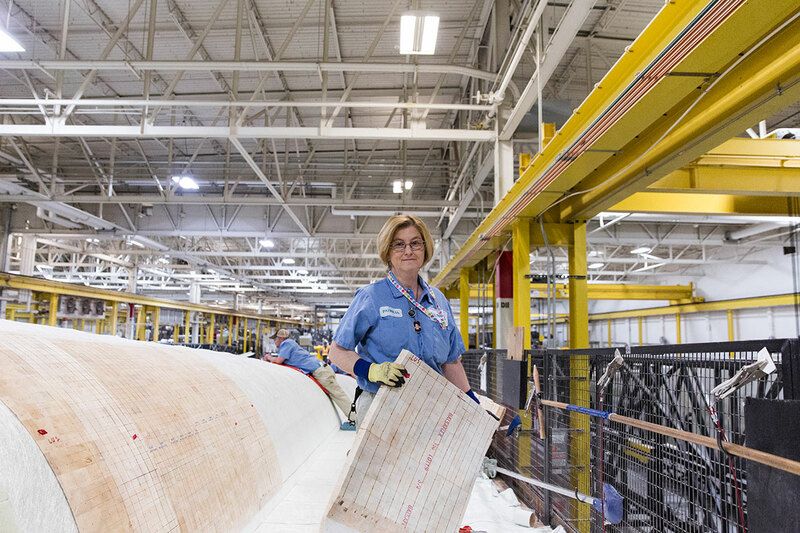 Siemens, for example, will introduce a 59-meter blade in the U.S. market, up from 53 meters, beginning in 2017. With all of this, of course, comes the need to boost and refine underlying technologies to make it all work.